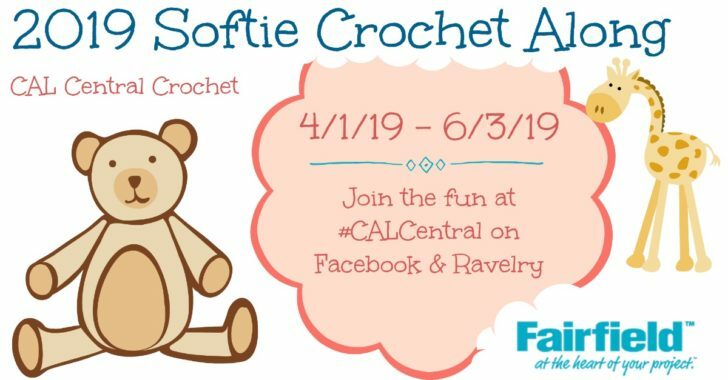 This pattern is also part of the CAL Central 2019 Softie Crochet Along, hosted on Underground Crafter! To share your projects be sure to use #CALCentral and #fairfieldworld! And there are prizes too, from Fairfield, Search Press North America, Clover USA, and MorgansMane! 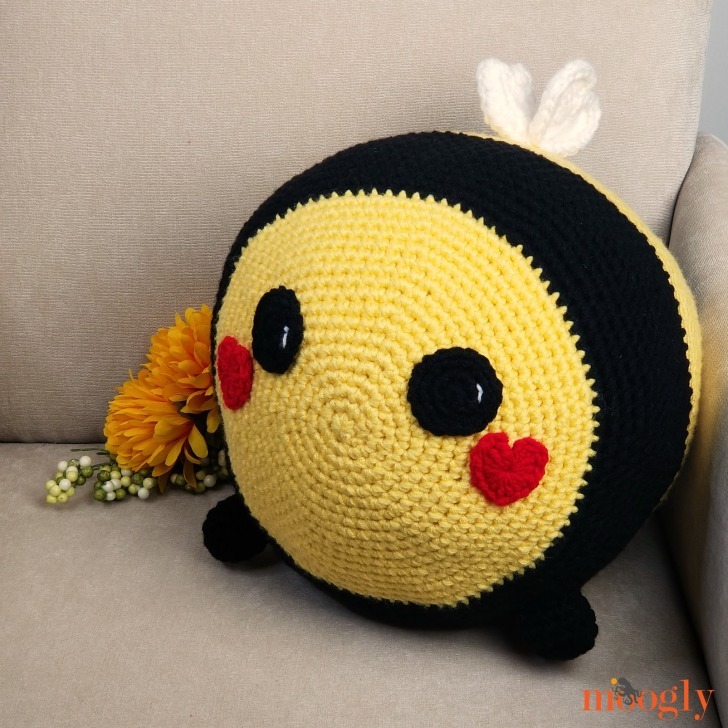 The Benevolent Bumble Bee is made with Red Heart With Love and stuffed with Fairfield Poly-fil. 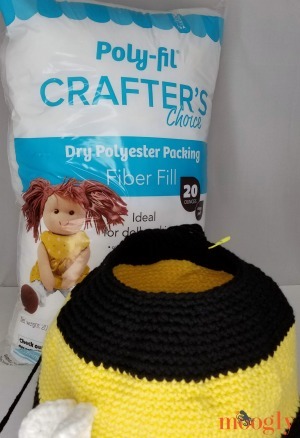 By holding the yarn doubled, and using a small hook, the fabric is tight enough to stuff without needing any sort of fabric lining. 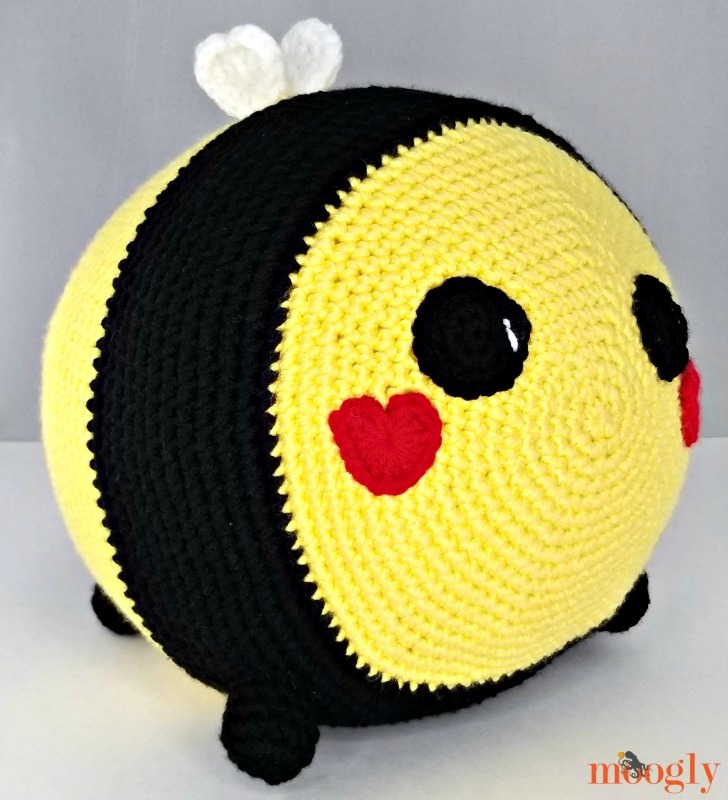 This pattern is also made amigurumi style (but so big!) – the rounds are worked in spirals, with no joins. This prevents that tell-tale seem, but you’ll also want to have stitch markers on hand to mark the first stitch of each round. 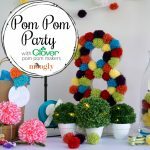 Believe me, you don’t want to skip it, especially when working with black yarn! 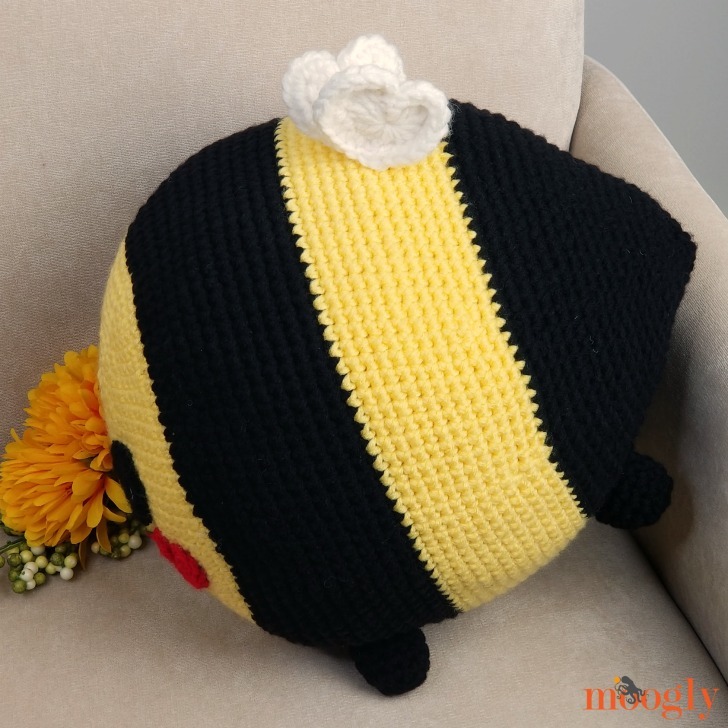 The Benevolent Bumble Bee does feature appliqued on facial features and feet – so if you make it for a child under age 3, you may want to skip the feet altogether and embroider on the facial features instead. Of course, this product has not been legally or officially child safety tested, so though it won’t fit through a toilet paper tube, please use all appropriate caution. Note that gauge is not important for this pattern, just make sure your stitches are very tight so stuffing won’t escape. For portions of this pattern, the yarn is held doubled. You can pull from both ends of a skein, or use 2 skeins at once. This pattern is worked in a spiral – do not join at the end of each round, and use a stitch marker to mark the first stitch of each round. All decreases were made using the invisible decrease – see the tutorial above. It’s easiest to make the “add-ons” first, but if you choose not to do so, then make them after Rnd 42 of the body. 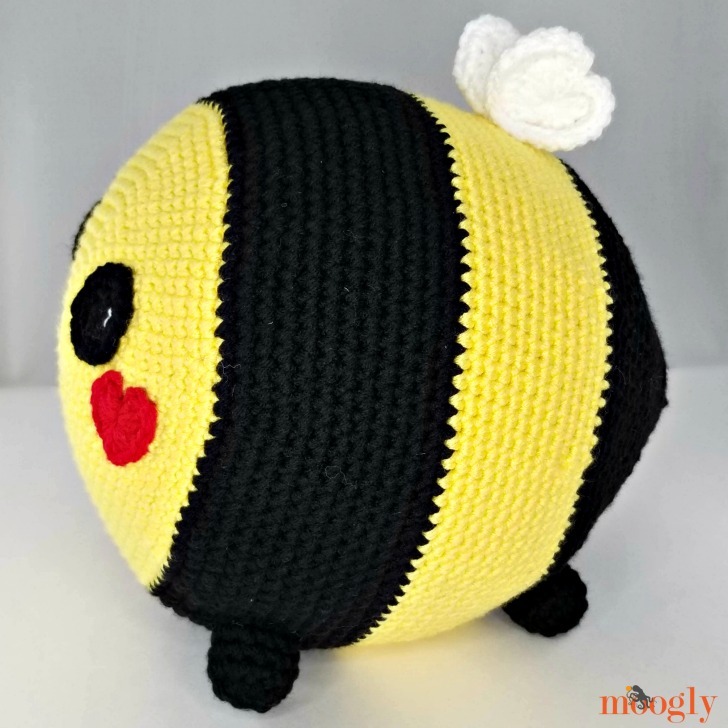 Do not forget to start firmly stuffing the bee before the hole gets too small! Rnd 3: *Sc in next st, 2 sc in next st; rep from * around. (18 sc) Break yarn and seamless join to first st, leaving long tails for sewing. 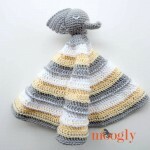 With Color C and a yarn needle, sew on white “glimmer” as shown. Set eyes aside. Rnd 1: Make a magic circle, work into the ring 3 dc, 4 hdc, dc, 4 hdc, 3 dc, ch 1, sl st in ring and break yarn, leaving long tails for sewing. Set hearts aside. Rnd 1: Make a magic circle, work into the ring 3 dc, 4 hdc, dc, 4 hdc, 3 dc, ch 1, sl st in ring. Rnd 2: ch 1, hdc in first st, 2 hdc in each of next 3 sts, hdc 7, 2 hdc in each of next 3 sts, hdc in last st, ch 2, sl st in sl st, break yarn, leaving long tails for sewing. Assembly: Sew wings together at the base. Set wings aside. Rnd 3 – 5: Sc in each st around. (12 sc) Break yarn and seamless join to first st, leaving long tails for sewing. Set feet aside. Rnd 23 – 30: Sc in each st around; at the end of Rnd 30, break yarn and seamless join. 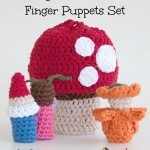 Rnd 32 – 39: Rep Rnd 23, do not break yarn. SEW on the Eyes, Hearts, and Wings as shown or as desired. And don’t forget to stuff! STUFF AND SEW on feet as shown or as desired. And that’s the Benevolent Bumble Bee! My favorite kind, as I have a mild allergy to the real thing. This one is much more cuddly! 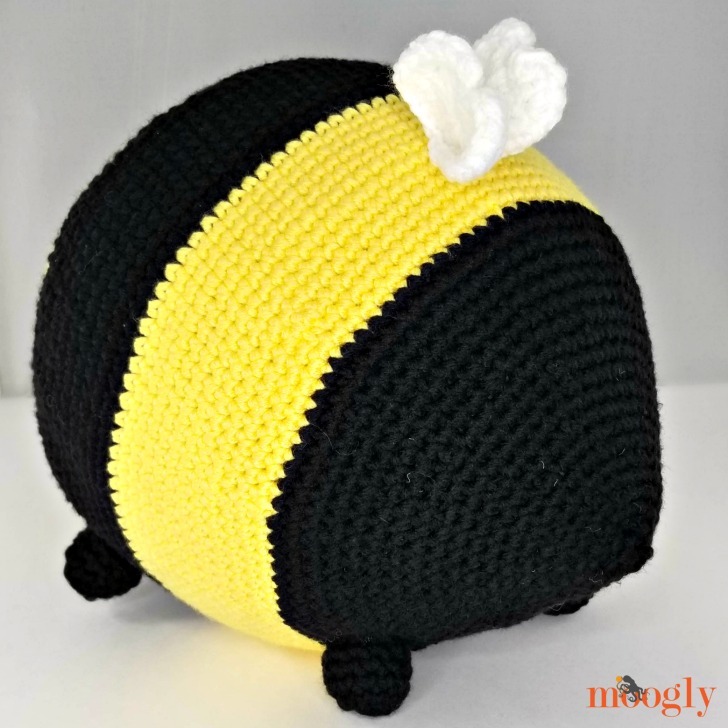 Ready to make your own Benevolent Bumble Bee? 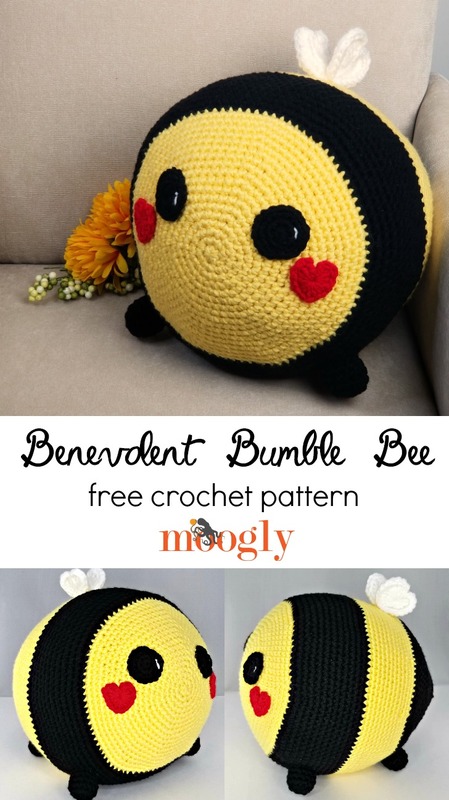 If this free amigurumi bee pattern does inspire you, and you post a photo on social media, be sure to tag me @mooglyblog or #mooglyblog so I can check it out too! I love seeing what you make! 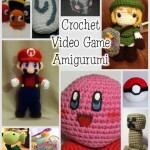 All Your Crochet Are Belong to Us – Video Game Amigurumi Patterns! This is adorable! I’ve tried amigarumi but my old eyes have trouble with the super small stitches. This I think I can handle and can’t wait to try it! Thanks for creating and sharing this!